In honor of Tiger Woods’ tenacious win at the Masters Golf Tournament in Augusta, Georgia yesterday, it seemed like a perfect time to tell you about our beautiful course here in Waterton. The Waterton Lakes Golf Course is one of Canada’s oldest, it was developed by genius golf course architect Stanley Thompson of Banff Springs and Jasper Golf Courses. It was constructed from 1929 – 1939 just after the Prince of Wales Hotel and the Northland Lodge were completed. The Waterton course will both challenge you and take your breath away. The great thing about this course is that it works for the novice golfer as well as those who are experts at the game. It is astonishing how impressive the mountain scenery is surrounding this course. Looking off down the valley you have epic views of Mt Cleveland, The Citadel, and The Prince of Wales Hotel sitting perched on its hillside. This public course offers a range of amenities including club and cart rentals, a pro shop, a practice green and a licensed clubhouse all of which are open seven days a week from May until October. This 18 hole course is challenging, fun, and reminds you of why you started to play the game. Located right in Waterton National Park (2.5 hours south of Calgary) and plays right next to the Southern Alberta Rockies. Like most of the courses in the Rockies, the mountain scenery is often a “hazard” all its own. This is a must play course if you are in Northern Montana or Southern Alberta. Its’ fairways are lush with its greens restored to reclaim their position as being among the best in Alberta. It is the only place I have golfed where without much effort you can see quite a bit of wildlife and marvel at the scenery. It is possible to see moose, fox, elk and bear. I’ve heard the bears love to break off the sprinkler heads to get a drink of watered play around the greens! 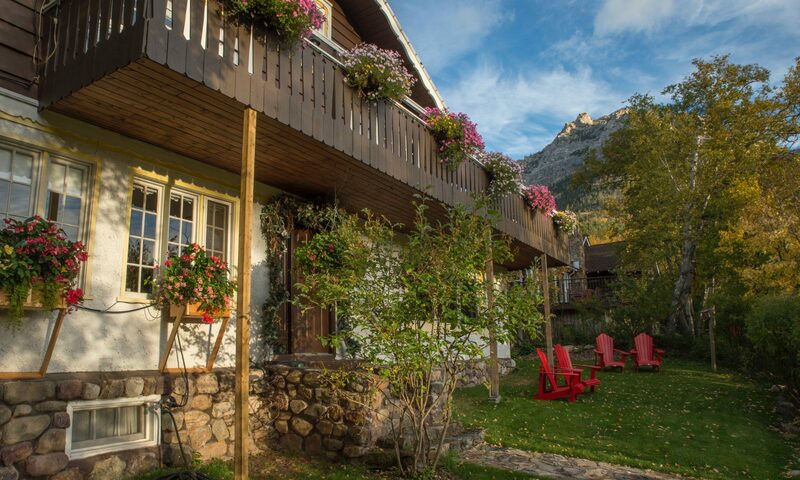 With friendly staff and unforgettable surroundings, this is the perfect place to spend a day in Waterton. The food at the clubhouse is very good with the beef dip sandwich being my absolute favourite. There is a lovely patio overlooking the golf course where you can sit and enjoy the scenery, eat lunch and visit with friends – and once again this is a public course and clubhouse so even if you don’t golf you can go to eat and just enjoy the epic views – no membership is required. We recommend this adventure highly when you are planning your visit to Canada, Banff, Waterton and Glacier National Parks; it is for sure a bucket list item in Waterton. Check them out at our website Northlandlodge.ca under things to do where you can book a tee time, reserve clubs and carts, view the course map, and read a description of the entire course. The wildlife here in Waterton and Glacier National parks love to eat berries and we have them everywhere. In Glacier the bears, wildlife, and humans love to eat huckleberries. What’s interesting is that huckleberries don’t grow as prolific in Waterton as Glacier. Here in Waterton we have Saskatoon Berries and that is what all of the bears and humans are searching out, and the bears eat mountains of these berries! Saskatoon berries were considered one of the most important foods to the indigenous cultures. The Blackfoot used fresh Saskatoon berries in soups, stews, and pemmican (their travel food which consisted of a combination of dried meats and berries). The berries were also used to make dyes and were a remedy for stomach aches, and liver problems. Dried berries were also a very important winter staple and trade item. This berry is about 1 cm in size (approx. 1/2 inch) in diameter and when mature turns a dark purple in color; it is very high in iron with lots of anti-oxidants. The seeds in this berry give it an almond like flavor. The plant grows as a shrub or small tree, and is quite at home here in Alberta. It blooms from May to June with fragrant white blossoms. In the fall their leaves turn crimson covering the mountain sides with a patchwork of color. The scientific name for the Saskatoon berry is Amelanchier alnifolia , in Canada this berry is called a Saskatoon Berry; in the United States it is commonly called a Service Berry or June Berry. At the Northland Lodge we offer our own Saskatoon Berry Jam, and pies for you to enjoy. We serve Saskatoon berry jam every morning with our complimentary homemade hot muffins, along with coffee, teas and juices. It is a great time for guests to meet, visit, discuss their adventures and plan their day! We also offer jams to take home to remember and share your visit in Waterton, Glacier and the Northland Lodge. While you are here you will also want to try our Saskatoon Berry Pie! This pie is delicious with ice cream and a wonderful treat in the evenings. If you have a family reunion or lots of mouths to feed we offer whole pies. For a midnight snack to share we have pie by the slice! Either way be sure to reserve your piece of pie beforehand as this coveted berry pie is limited! One of our favourite hikes right outside the Lodge’s door is the Bertha Lake Hike; this hike traverses up Bertha Peak to a beautiful alpine lake. The trailhead starts just a block down our back alley; it wanders down the valley for about two miles where you come upon Lower Bertha Falls. Past the falls you start-up switchbacks ultimately summiting to the lake. We have had a guest that counted the switchbacks and said there are 21! The hike to Bertha Lake is 10.4 km/6.5 miles round trip and a great day hike from the Lodge. No driving to trailheads required, and if you think it is too much you can always hike to the falls and return. Bertha Peak (8,005 ft, 2,440m), lake, and falls have been said to be named after a longtime resident of the park. The story goes that Bertha was a bootlegger during prohibition, however, no one seems to know her last name, or much about her. Originally the lake was named Spirit Lake but back in 1914 it was posted on a map as Bertha Lake and the name has stuck. There are other mountains, lakes, and landmarks in Waterton that have had their names changed over the years. Sheep Mountain became Vimy Peak or Vimy Ridge, in memory of Vimy Ridge battle during WWI. Mount Crandell was known by the locals as Black Bear Mountain or Bear Mountain and Blue Lake became Crandell Lake. Bear’s Hump another famous hike in Waterton was originally known as the Pimple. Yikes, I think I prefer Bear’s Hump! And after a day long hike there is nothing better than sitting on the Northland Lodge deck visiting with friends and family, relaxing and telling stories of your days adventures. We have tried over the years to incorporate things that will enhance our guests’ experience and tell a memorable story of Waterton and Glacier. Consequently, almost everything at the Northland Lodge has significance, from the big details such as pressing our sheets daily, because that is what Great Grandma Jensen did, to the smaller items like the daily china that we us. Our china pattern is Johnson Brothers Blue Willow pattern; there is a story behind it, from the pattern itself to why it’s used at the Lodge. The Blue Willow pattern is believed to be the original pattern used at the Prince of Wales Hotel in 1927. When the hotel was remodeled and updated the china was sold off and replaced. The Great Northern Railway had just years earlier, in 1924, introduced its Oriental Limited Express rail cars. These Pullman built sleepers, diners and observation cars were designed to be the finest trains operated between the Pacific Northwest and Chicago. The Blue Willow pattern may have been chosen to compliment the rail line with the Hotel. Louis Hill was famous for pulling concepts together from the train lines, to the vessels the Great Northern owned to the Hotels and the park, all in an effort to generate interest in visiting Glacier and riding the trains. The first known printing of the Willow pattern goes back to the mid 1800’s. Over the years the Willow Pattern Legend has been passed down from generation to generation. We had a guest a few years back who was ecstatic to see we used Blue Willow because as a child her father had worked at the Prince of Wales Hotel and she remembered it along with the legend that her mother had told her about the pattern on the plates. The legend goes like this…. And the little brown man with a queue. On the old china ware plate from the East. Might never wed pretty Koong Shee. In a little blue house by the lake. That silly romance from her head. She should ride in a gold wedding chair. And taken his sweetheart away. Stood waiting for Chang and Koong Shee. And traveled away with the prize. A pair of doves winging away. Across my Willow ware plate. So you are planning your summer vacation to Waterton-Glacier International Peace Park and are trying to figure out what to spend your precious time doing while here! In Waterton there are several epic hikes that are bucket list worthy and one of them is the Crypt Lake Hike. National Geographic has rated this hike one of the “World’s 20 Most Thrilling Trails!” It is an all day hike (5-8 hours) and a bit of a challenge — but manageable. Make sure you bring plenty of water, lunch, and snacks. Last time I did this hike I did not bring enough water and it was not much fun; you are exposed on the south side of the mountain for a fair amount of the hike and water is really, really, important. What makes this hike so interesting is that you get to experience many different elements. To start you take a 15 minute boat ride over to the trailhead at Crypt Landing which is located across Waterton Lake. Check our web-site under things to do for information to Waterton Shoreline Cruise Co. In peak season there are several boat shuttle start times, I recommend the 8:30 or 9:00 time slot as it can get quite hot in the afternoon and you can also spend more time at the lake if you get going earlier; mind the clock in order to catch the return boat. Believe me when you are done with the hike and waiting for the boat you just want to be home! The hike passes 4 waterfalls: Hell Roaring Falls (1km), Twin Falls (3.5 km), Burnt Rock Falls (5.6km) and Crypt Falls, (8km). As you approach the top of the pass you come to a steel ladder you ascend to enter a 60 foot tunnel through the mountain which is completed with a short maneuver around a cliff utilizing an anchored cable, to help with security, …… then after a short walk you arrive at the Lake. Crypt Lake is surrounded by towering cliffs and if you look closely you may see Mountain Goats. It’s a great spot to sit, eat lunch, fish for local Cutthroat Trout in the alpine lake (provided you have a fishing license), and relax for a short period while you prepare for the return trip. All of the Northland Lodge guests who take this hike rave about it; when they get home they love to sit on the deck with a cold beverage, relax, take a look at their pictures of the day, and tell us about their adventures on the this epic hike. I must admit my favourite memories in Waterton are: after completing a hike such as this, relaxing in one of our lounge chairs on the deck with a cold beverage, my shoes off with my tired toes cooling in the breeze! At the end of the day it feels so rewarding to have completed a long hike with family and friends admiring beautiful scenery, and having sore muscles. Elevation Gain: 700m / 2300ft. At the Northland Lodge we try to introduce you to great, homemade, garden fresh, Canadian prairie food. Rhubarb is one of those wonderful prairie foods; from jam to pie to ice cream sauce it is delicious. I remember as a kid eating warm rhubarb sauce with ice cream and a dollop of whipped cream, just the smell of rhubarb reminds me of my childhood; strawberry-rhubarb pie is another favourite of mine. Rhubarb is really interesting, it is a big beautiful plant that you pull by the roots like swiss chard, however, just the stalk is used in cooking. We had a spot in the garden where I decided to plant some rhubarb a couple of years ago. The first year it is planted you cannot use the plant but the second year of growth you can start pulling stalks for cooking. It grows to a large beautiful plant with lots of foliage, and the deer do not like to eat it so it is perfect in our garden. We have experimented cooking with rhubarb creating rhubarb pie, rhubarb curd and of course one of our best-loved items, our Rhubarb Muffins. I have had so many people ask for this recipe, that I decided to share it with you so you can make your own and reminisce about your visit to the Northland Lodge, Waterton Lakes National Park, Glacier National Park, and Canada. Spray 12-cup muffin tin with vegetable oil spray; set aside. Whisk together flour, baking powder, baking soda, and salt together in a medium bowl; set aside. Using a mixer blend butter, sugar, vanilla, and eggs on medium speed until creamed together. Reduce speed to low and mix in half of the flour mixture, followed by half of the yogurt (milk) mixture; repeat until all ingredients are blended. Fold rhubarb into the batter. Crumble together the flour, pecans, butter, sugar, and cinnamon with a fork or fingers. Fill muffin cups about two-thirds full, then sprinkle topping over the top of the batter. Baking time will vary depending on altitude and the weather, it is generally about 21-24 minutes in Waterton and we are about 4000 feet above sea level. There is always a bit of confusion with the names of Waterton and Glacier National Parks. There is: Waterton Lakes National Park, Waterton Park, Glacier National Park and Waterton-Glacier International Peace Park. Hopefully some of this information will clarify the parks and their titles. John George “Kootenai” Brown was Waterton’s first forest ranger in charge and was credited for inspiring the idea of linking the two parks. Brown realized that the border means nothing to the wildlife and linking the parks would help preserve animals and their breeding grounds. also played an instrumental role in developing the idea, with the construction of the Prince of Wales Hotel, the railway started including Waterton in its advertising campaigns. The “Peace” element was developed in honor of the horrors from the Great War (WWI) which had ended 13 years earlier, thinking that the rest of the world might admire the peaceful relations between Canada and United States. It took 11 months for the US Congress and Canadian Parliament to pass individual pieces of legislation to create Waterton-Glacier International Peace Park and was accomplished in large part to the urging of the Rotary Clubs in Alberta and Montana. On June 18, 1932, the parks, celebrated the passage of similar bills in the United States and Canada, along with over 2000 Rotarians and guests gathered at Glacier Park Hotel to dedicate the Waterton-Glacier International Peace Park. Even with the creation of “Waterton-Glacier International Peace Park,” The Great Northern Railway never used this name in its advertising campaign, it was too long and awkward and they were intent on Glacier as their main focus. Rather, the Great Northern Railway used phrases as “Glorious Glacier.” When Waterton was mentioned in advertisements or on brochures, it was usually second or in smaller print. Today, Glacier Park, Inc., which operates the hotels previously owned by Great Northern, will reverse the names of the park to Glacier-Waterton in its advertising material. Waterton-Glacier became the first International Peace Park in the world in 1932, since then there has been 138 Peace parks around the world that have been created. In 1995 it was designated as a UNESCO World Heritage Site. At the time it was the only Site consisting of two adjoining parks in different countries. In 1927 while Louis Hill and the Great Northern Railway were building the Prince of Wales Hotel in Waterton Park they were also working feverishly on their marketing campaign to introduce the public to Waterton with its new hotel, Glacier Park and to ride the Great Northern Railways. Part of their marketing campaign included art work from many different artists of the era, the Blackfeet Nation and their role in Glacier (as the United States Government purchased the land from the Blackfeet) and the wild majesty both parks displayed. There are three tribes that comprise the Blackfeet Nation, the Pecunnies (Piegans), Bloods, and Blackfeet. The Piegans and Bloods are located in Alberta, Canada and the Blackfeet are located in Montana on the United States side of Waterton-Glacier International Peace Park. Wenhold Reiss,(1886-1953) a German artist, who was enamored with Glacier, Waterton and the Natives of the area became famous for painting portraits of many of the Blackfeet Natives or as they are now called in Canada, First Nation. He was renowned for his colorful portraits of the Alberta and Montana Natives. He is also known for his Restaurant designs in New York City such as the Restaurant Crillon, the Longchamps chain and the Tavern Club of Chicago. Reiss’ murals from the Longchamps restaurants are now in the lobby of New York’s Shoreham Hotel. Mike Oka (to your right) was another Blood Tribesman that painted some of the pictographs in the Prince of Wales Lobby. He was present as a boy in 1877 at the signing of the treaty of Blackfoot crossing between the Canadian Government and the natives. For several years he was a native scout with the Royal Northwest Mounted Police. Mr. Reiss painted many of the local natives, their portraits were printed, put on calendars and used in marketing campaigns to promote the park, The Great Northern Railway and educate travelers of their adventures in Waterton and Glacier National Parks. There were many beautiful pictographs created for the Lobby of the Prince of Wales Hotel, they covered the walls and created light shades for the fixtures as you can see in the photo to your left. These painted pictographs remained in the Lobby until the 1960’s (I believe) when the lobby was remodeled they were taken down and moved to Glacier Park Hotel in East Glacier, where they remain today. If you go into the lobby you can see some of the artwork created back in 1927, descriptions of the artists and the stories their respective pictographs depict. The Prince of Wales Hotel was opened for business in 1927, by August of 1928 Louis Hill and the Great Northern Railway had completed building the International Boat and Carthew Lodge now named Northland Lodge in Waterton Lakes National Park. Lavender is one of the oldest scents in the fragrance world and is made from the oils extracted from the lavender plants grown in France. This magical herb and its essential oils are said to promote relaxation, relieve stress, and act as a natural antibiotic. For decades now we at the Northland Lodge have been spraying our line – dried linens with lavender water in our pressing process to help promote a calming atmosphere and a restful sleep. I love the smell of Lavender and grow it in my garden at home, but I was never sure how to harvest and use it at home… until recently. Come to find out there are basically two species of Lavender English Lavender (Lavandula Angustifolia) with delicate flowers and long stems and Spanish Lavender (Lavandula Stoechas) with showy flowers on a perennial shrub. The most commonly used plant is the English Lavender which is the one used for Lavender water at the Lodge. Now we offer a wonderful Lavender Hand cream for those heavily used hands, whether it’s for gardening or housecleaning this hand cream with shea butter and essential oils of lavender help to sooth and relieve achy hardworking hands. How do you harvest your lavender plant? I have learned the best time to harvest lavender is when the buds have formed on the plant but the flowers have not yet opened. Lavender harvested at this time in the plant’s growth will allow the buds to fall off the stems more easily when dry, making it easier to collect. It will also retain the fragrance and colour longer. Pruning the plants like this will keep the shrub tidy and green through colder weather. It is best to prune the plants each summer to maintain a controlled shape and get the most of your harvest. To dry bunches, hang them in a warm, dry spot out of direct sunlight. Ideal places to hang bundles is under eaves of your home, in the garage or along a shady fence. After the bundles have dried for about two to four weeks, you can shake and gently rub the flower buds into a tray. Store your lavender in a lidded jar in a cool dark place and repeat next year. It is always important to store your unused natural fragrances in a dark place (including perfume) to maintain the fragrance. Now you can use the buds in trays for room fragrance, put into sachets for linen closets, and in your bath with some bath salts for a relaxing soak. It just may help you sleep like a baby! Thanksgiving, my favorite holiday, it’s all about food, family and beautiful table settings. I remember as a child helping my mom pull out our best china, setting the table and getting ready to see all the relatives. My mom, Joanie, was a wonderful cook and knew a lot about setting tables and proper etiquette. Some of what she taught me has stuck and I’ve learned more over the years; I am passing on some tidbits that you might find interesting. I prefer to use napkins that are 20×20 in size. The secret to create a well folded napkin is starch. I will make a fold and press each fold with spray starch to keep the fold in place. These do take a little practice to get right but once you get the hand of it they will impress all of your guests! Use your napkin to gently dab your mouth, not wipe your face or blow your nose!